Many of you know that at The Armchair MBA we have at times indulged in a bit of tomfoolery, and April 1 is no exception. The best April 1 pranks are those that have the initial feel of legitimacy, but as the reader continues there is a point where it just goes too far. Like the frog that ultimately boils, when well done it’s sometimes hard to pin down the exact point of departure from truth. MelaniaCare (last post) was one that, while fabricated, we have started to believe ourselves – – and it might come true yet. The attached was also discovered on April 1 so posting here. But the real prize is this collection of April Fool’s Day pranks, compiled by Lisa Lacy of Momentology. If you have a moment, these delightfully demonstrate the magic that results when creative and devious minds are working for themselves and are liberated to listen to their own inner gremlins, rather than trying to placate some client. 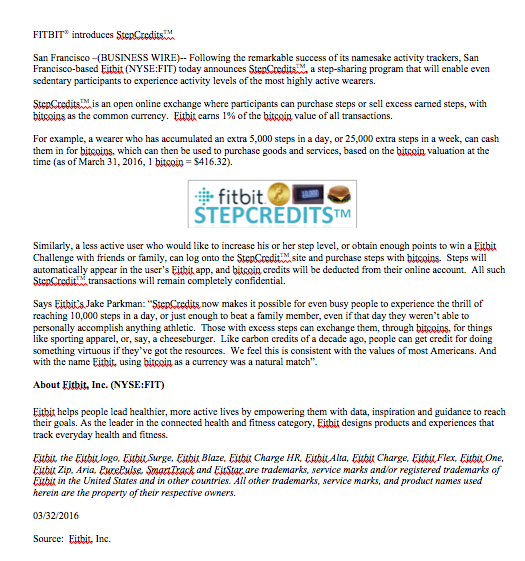 Posted in Branding, Marketing and Media and tagged April 1, April 1st, April Fool’s Day, April Fools', Fitbit, Fitbit StepCredits, Lisa Lacy, MelaniaCare, Momentology, StepCredits. Bookmark the permalink. The recent announcement on Donald Trump’s website about the development of MelaniaCare may end up being just more fodder for late night comics, but it actually is a smart move and entirely consistent with the Trump brand. “MelaniaCare”, like ObamaCare, is a nickname – in this case for the Appearance Optimization Act (AOA), inspired by Mr. Trump’s wife. In short, MelaniaCare proposes that all legal American residents be given access to affordable services that assist in optimizing physical appearance, including serious birth-related issues, but also a broad range of cosmetic deficiencies. Treatments would be funded by a mandatory allocation of 10% of services of relevant professionals (such as plastic surgeons) to citizens with insufficient means to afford treatment. Mr. Trump has promised to personally fund procedures that he deems high priority. 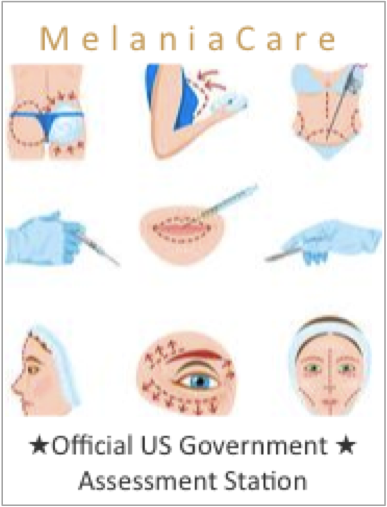 All legal female US residents over age 20 and under 60 would, within one year of enactment, be required to have a free appearance assessment, consisting of one facial photograph and two full body photographs (front and back), that would be taken at any US Post Office or passport office. Funding for these photographs would be through an extension of the ACA (ObamaCare). Photographs would be assessed via computer algorithm, indexed against age ranges (20-29, 30-39, etc) as well as regional norms (West Coast, South, Midwest, New York, Texas, etc.) as determined by regional panels of age-appropriate men. Similar to a draft number, each participating citizen would be given an ‘appeal’ rating from 1 to 10, with those ranking 1 having highest priority for immediate and mandatory enhancement services. Those ranking 7 or above are not expected to require any further treatment. Level of subsidization will be calculated through a formula balancing severity of need with ability to pay, and will be administered by the Internal Revenue Service. Treatment will be required within one year of receipt of appeal rating, after which time appearance will be reassessed by the same panel. Patients deemed to not have sufficient improvement will be ‘fired’ (in program parlance) and will be given appropriate visas and moving expenses to relocate to other countries, or to a rural ‘containment’ area within the US, where they will support the US telemarketing infrastructure. Men’s appearance will be addressed after all women have been assessed, treated and relocated as appropriate. MelaniaCare was tested for 15 months in Scottsdale AZ and Palm Beach FL, and while the level of untreated citizenry was extremely low, the mechanics of the program worked well. Per Mr. Trump: “Scottsdale and Palm Beach were enormously successful tests of the system, which gives us really unbelievable confidence when we extend it to areas of extreme need like the Midwest and Appalachia”. Attractiveness as a determinant of success is a taboo topic, but undeniably is a real factor that is perpetuated by popular media. Mr. Trump, true to form, is unapologetically addressing this issue head-on, and claims that ultimately it will help the American people “in a really big way”. “Pardon the expression, but a hot woman gets more attention and preferential treatment than an ordinary-looking woman. Think of the advantages the US will have if we export those who have been given a fair chance but just aren’t making it, and we improve the appearance of everyone who remains. We will tilt the playing field in our favor and will be able to negotiate some unbelievably awesome deals”. Mr. Trump has already unveiled a new baseball cap promoting the program. 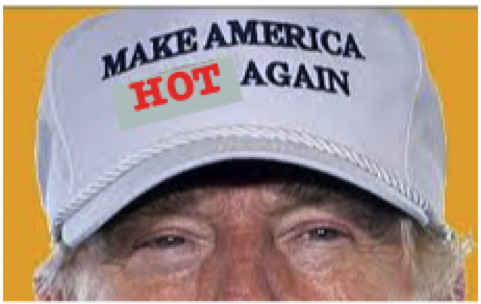 Wags are predictably calling this the Affordable Hotness Act (AHA), and using it as further proof that Mr. Trump represents a new low in American political life and culture. On the other hand, Mr. Trump has done nothing but flaunt convention in this election cycle by appealing to a core base and making it work for him. An unscientific poll of Trump supporters showed strong support of MelaniaCare should it be signed into law. MelaniaCare would certainly face challenges in the House and Senate, but regardless of the outcome, consider it another example of how to aggressively extend one’s brand. Posted in Branding, Marketing and Media and tagged ACA, Cosmetic Surgery, Donald Trump, MelaniaCare, Obamacare, Palm Beach, Plastic Surgery, Scottsdale, Trump. Bookmark the permalink.